Terrence Steven McQueen, (Steve McQueen as we know him), is maybe one of the biggest icons to date. Born March 21 1930, the U.S was treated to a true star. 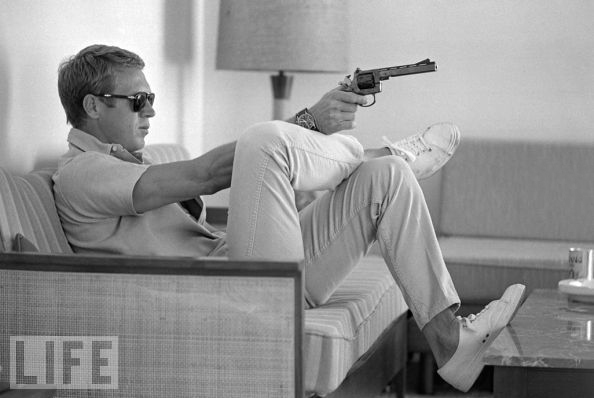 Effortlessly stylish, and the highest-paid star of his time, McQueen was envied by many, and we can see why. His look? American sportswear, and lots of it too. McQueen had a unique style, which many have tried to emulate ever since. Hallmarks included windcheaters, Harrington jackets, rugged boots and aviators. 'A real man'. His admiration for racing helped shape many of his looks. Often you would catch him in simple cotton t-shirts, leather jackets and plenty of denim. Though an expert at dressing down, he didn't scrub up to bad either. So much so, Rolex named their sophisticated Explorer watch after him, officially calling it the McQueen Rolex. To add, the icon was the first man to grace the cover of fashion magazine Harper's Bazaar. Not bad eh? If it's someone cool you want to copy, then McQueen is your man. His style was all about clear-cut masculinity, so invest in pieces that look better with age, such as a denim shirt, or leather jacket. You may never cut it as good as the man himself, but there is no harm in trying.